According to a study published in a recent issue of Science, young adults who are at a higher genetic risk for Alzheimer’s disease may already show differences in how their brains handle spatial navigation. Researchers say that it’s too early to tell whether the brain differences are an indication of Alzheimer’s: “That is still unclear and needs to be investigated in further studies,” says senior researcher Dr. Nikolai Axmacher of the German Center for Neurodegenerative Diseases in Bonn. Even so, researchers are hopeful that study findings will help improve understanding of the earliest processes that lead to Alzheimer’s. Axmacher notes that if brain differences do predict Alzheimer’s disease, that information could be used to identify high-risk people earlier. The study involved 75 young adults, half of whom carried a variant of the APOE gene that may boost the risk of Alzheimer’s. According to Axmacher, one in six people carry the variant APOE4 and they have a higher risk of developing Alzheimer’s compared to non-carriers. An advanced form of MRI was used to study the brain area known as the entorhinal cortex, which contains “grid cells.” Axmacher explains that those cells are essential in spatial navigation. The team tracked the activity in the grid cells as participants navigated a “virtual” task that measured their spatial memory. Participants were required to remember the spatial location of objects in a virtual arena, and place those objects in the correct place. What did the team find? They found that, on average, those carrying the variant APOE4 showed less functioning in their grid cells during the task compared to participants who did not carry the variant. 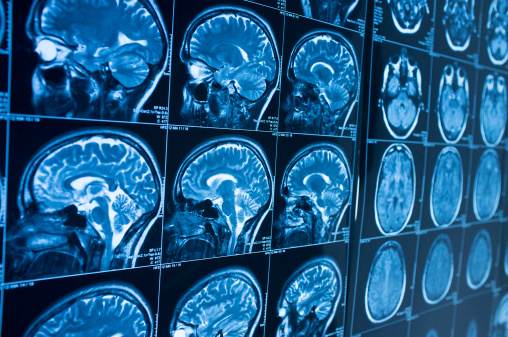 Both groups still performed similarly on the test, which raised the question as to whether APOE4 carriers compensated by using other brain regions to navigate through the task. “Indeed we found that the less intact the grid cell system was, the more active an adjacent brain area, the hippocampus, [was],” added Axmacher. What was interesting, he added, was that APOE4 carriers showed a different strategy during the test: they navigated from a vantage point along the border of the virtual arena, while non-carriers navigated from the center. Researchers note that other research suggests that excess activity in the hippocampus is part of the process that can lead to Alzheimer’s. Dean Hartley, director of science initiatives for the Alzheimer’s Association, agrees that the results do hint at a possible new biological marker. He notes that the findings offer more clues about the roots of Alzheimer’s, which could help develop new therapies. Norton, A., “Brain Differences Seen in Young Adults at Genetic Risk of Alzheimer’s,” Medicine Net web site, October 22, 2015; http://www.medicinenet.com/script/main/art.asp?articlekey=191380.